Stephanie and Shane McMahon kicked off the first night of the Superstar Shakeup and Shane made the ring announcer do his intro properly. He himself then said 'Best in the World' in French before the crowd started booing him. 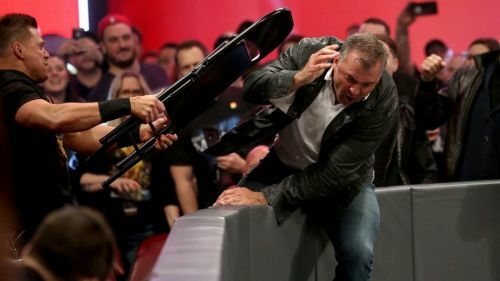 He then boasted about beating up The A Lister's dad at WrestleMania before The Miz's music hit and he attacked Shane from offscreen. Shane and Miz brawled before The A-Lister took a steel chair fought Shane off. 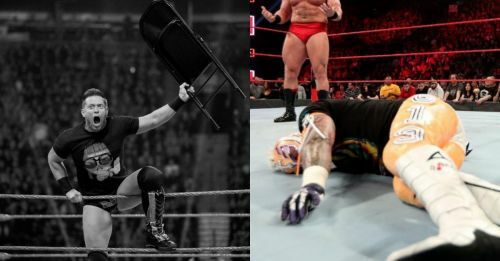 Miz was bleeding from the head as he held up the chair and Shane retreated backstage. The Miz is the first Superstar to be drafted to RAW. Hawkins and Dawson kicked off the match and Ryder was tagged in, followed by Ricochet. Black was legal and so were the Viking Experience, who hit a double team move. Wilder put Hawkins in a sleeper hold; Hawkins countered but Dawson was tagged in. Hawkins somehow tagged in Ryder who landed a dropkick on Wilder on the outside before landing forearms on Hawkins. There was chaos all around the ring. The Viking Experience outnumbered Hawkins as he was thrown outside onto Black and Ricochet. Ivar went to the top rope and landed the Fallout as Ryder was pinned. Finn Balor came out and Andrade was our next RAW draft as he and Vega challenged Balor top a match. Andrade went for the moonsault but Balor stepped out and after a drop kick, went to the top rope. Andrade quickly brought Balor down. Balor landed one more enzugiri and then went for the Coup de Grace, but Andrade countered. Andrade was thrown to the outside. Zelina Vega interfered but Balor went over Vega to land a moonsault. Andrade interfered and Vega landed a hurricanrana on Balor before Andrade took advantage and got the win.